This weekend the Centre for Marine Science and Technology (CMST) deployed two noise loggers in Albany, Western Australia to record underwater sounds, and I had the pleasure of assisting! 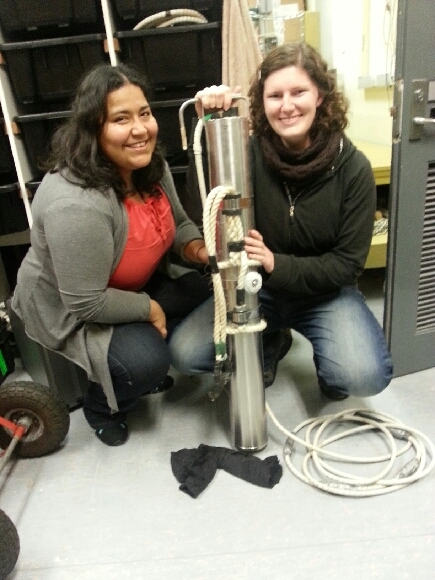 Angela and I with our first ever sea noise logger! On Thursday, my supervisor Dr Chandra Salgado Kent (deputy director of CMST) showed Angela and I how to calibrate and prepare the noise loggers, which are specially designed and built by CMST. Essentially an underwater microphone, the noise loggers have previously been deployed all around the Australian coast, allowing CMST to build up a catalogue of underwater sounds and tackle various questions in marine acoustics research. As the centre’s two newest PhD students, these are pieces of equipment we are going to become very familiar with over the next few years! We were shown how to program the noise loggers, which can be set to different sampling rates – they might record most of the time, or only every so often depending on the research question. We also learnt how to secure the noise loggers in their casing, ready for deployment! The next day Chandra, Jose and I drove the two noise loggers down to Albany, ready for an early-morning deployment on Saturday. Two officers from the newly formed Department of Parks and Wildlife (DPaW) kindly met us at 7am to help finish preparing the noise loggers, then took us out in their vessel to deploy the loggers along with a representative from Albany Port. Although there was a wee bit (i.e. fricking huge amount) of swell, we managed to get both loggers deployed in King George Sound – success! We were also lucky enough to spot some marine mammals, with both bottlenose and common dolphins popping up next to the boat and plenty of New Zealand fur seals lounging around on the rocks. A promising sign for a marine mammal research project! Now the noise loggers will (hopefully!) record for the next two months, recording the underwater ‘soundscape’ of King George Sound. The project is a first for Albany, and will record all sounds produced in the bay be it from natural (waves, rain), biological (fish, whales, dolphins), or man-made (ships) sources. But the main focus of this project are the humpback and southern right whales which use the area during their seasonal migrations. Whales appear to be very vocal, with male humpbacks being particularly renowned for their ‘songs’, the purpose of which is still under debate. However, both male and female whales also appear to produce ‘social sounds’, which may be used in various behavioural contexts. The type and number of calls recorded help to give an idea of how many whales might be present in the area, and what they are up to. This data will act as a pilot field season, which can be built upon in future years to establish trends in whale abundance and seasonality over time. This will provide an idea of migration patterns for these species. It’s an exciting development, and has already received media attention from the local press (“Whale song to be recorded“). Now we just have to wait two months to hear what the whales are saying! This entry was posted in Research, Whales and Dolphins on August 6, 2013 by Sarah Marley.